BISMARCK, N.D. (AP) — North Dakota's House has passed a bill that would require more law enforcement training related to missing and slain Native Americans. Representatives voted 90-2 on Tuesday to approve the measure sponsored by Fargo Democratic Rep. Ruth Buffalo. She is the first female Native American Democrat elected to the state Legislature. Buffalo also is sponsoring a bill that would collect data on missing and slain Native Americans in North Dakota. FARGO, N.D. (AP) — Former Vice President Joe Biden kicked off Democratic Sen. Heidi Heitkamp's final statewide campaign tour Thursday in a whisper instead of his usual fiery tone, making a quiet call for civility that was accentuated by laryngitis. 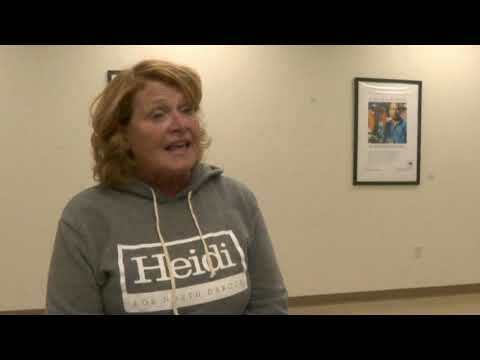 BISMARCK, N.D. (AP) — U.S. Sen. Heidi Heitkamp spread nearly $2.7 million of her campaign cash to the North Dakota Democratic Party to help candidates in statewide races. State filings show Heitkamp's contribution last week came just days after her own campaign hauled in about $12.4 million in the first half of October. The flood of cash to Heitkamp came during the period in which she voted against Brett Kavanaugh's Supreme Court nomination. BISMARCK, N.D. (AP) — The U.S. Senate has confirmed the leader of North Dakota's Bureau of Criminal Investigation to be the next U.S. marshal for the District of North Dakota. President Donald Trump nominated Dallas Carlson in March. U.S. Sens. John Hoeven and Heidi Heitkamp say he was confirmed Thursday. Carlson has worked in law enforcement for more than 35 years, including 29 years at BCI. He's been the agency's director since 2011. BISMARCK, N.D. (AP) — North Dakota Sen. Heidi Heitkamp's decision to vote against Brett Kavanaugh's nomination to the Supreme Court defies her state's heavy support for President Donald Trump, but could boost the vulnerable Democrat's standing with independents and women.